For most performance data processed by the Performance Co-Pilot (PCP), the information is gathered by domain-specific agents or Performance Metric Domain Agents (PMDAs). 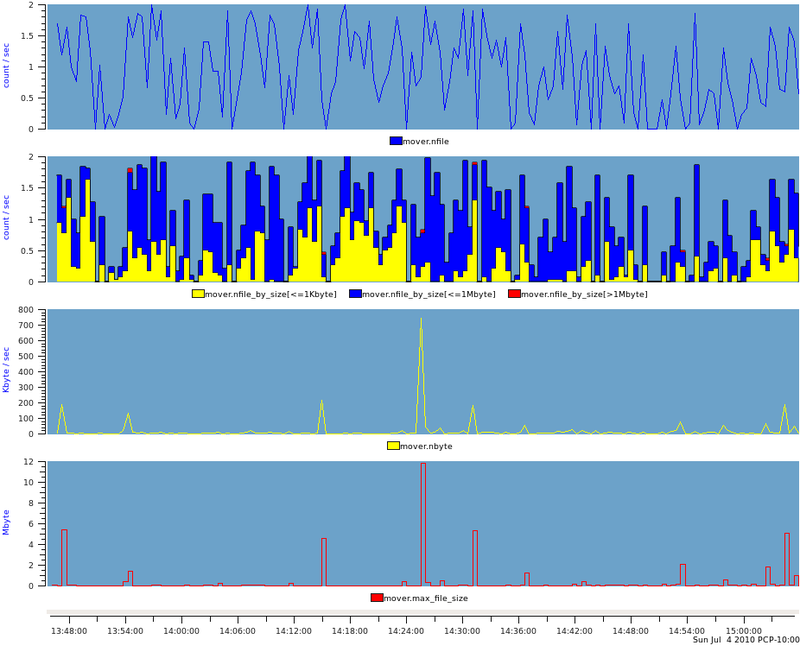 The data and metadata (describing the performance data) is then provided via the Performance Metric Co-ordinating Daemon (PMCD) directly to real-time PCP monitoring tools like pmchart , pmie , pmval , etc. or written to PCP archive files by pmlogger for subsequent retrospective analysis using these same PCP tools. This document describes an alternative method of importing performance data into PCP by creating PCP archives from files or data streams that have no knowledge of PCP. The services needed to build an import tool are included in the libpcp_import package and a Perl wrapper is provided in the PCP::LogImport module. The C and Perl APIs are effectively identical. Refer to the LOGIMPORT (3) manual page for an overview of these services. The examples in this document will be given in Perl. sheet2pcp Import data from a spreadsheet in CSV, OpenOffice or Microsoft Office format. sar2pcp Import data from the sadc (System Activity Reporting Collector) that is part of the sysstat package and modelled on the classical Unix sar tools. iostat2pcp Import data from output of the iostat command that is part of the sysstat package and modelled on the Berkeley Unix command of the same name. These scripts are all written in Perl, and we shall refer to them in this document to present examples of specific aspects of the LOGIMPORT services or the issues to be considered when building an import tool. Each line begins with a date and time, then the count of the number of files migrated over the last time interval, then three counts in parenthesis corresponding to the number of small files (less than 1024 bytes), medium files (less than 1024*1024 bytes) and large (more than 1024*1024 bytes) files that were migrated, then the total number of bytes moved and finally the size (in bytes) of the largest file moved. Timestamps . A PCP archive is a time-series of observations, hence we need a date and time stamp for each observation. In the simplest case there is a representation of the date and time in the input records. Sometimes the date and time appears as a text string, sometimes it is encoded in a binary file and sometimes it requires some guesswork to reconstruct the date and time of each observation (see iostat2pcp for example). In all cases, it will be necessary to have the datestamp available in the internal system clock format, namely seconds and microseconds since the "epoch". Fortunately the Perl module Date::Parse does a reasonable job of parsing dates and times in text format, although some preprocessing of the date may be required to force into an ISO 8601 compatible format (see dodate() in sheet2pcp , iostat2pcp and sar2pcp for a number of examples). We shall return to timestamps and the associated matter of timezones a little later in this document. Regular format . Some file formats (often application logs) can be quite difficult to parse and extract the data you wish to import into PCP. Pre-processing can help remove ambiguities, cull irrelevant information and make life generally easier. As an example, sar2pcp uses sadf to translate the binary data file from sadc into an XML stream that is much easier to process. Incremental development is encouraged. So we shall start with one metric being the number of files migrated. The first task is to assign a name – the rules must conform to those for the Performance Metrics Name Space (PMNS), namely a number of components separated by periods "." with each component starting with an alphabetic followed by zero or more characters drawn from the alphabetics, digits and the underscore "_" character (see pmns (5) for more details). 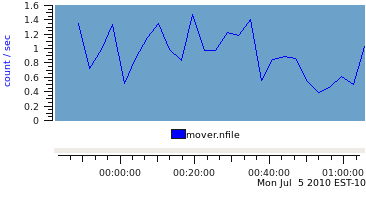 For our metrics we'll use the prefix mover. 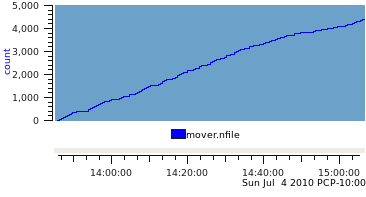 and so the first metric will be known as mover.nfile . Next the metadata for each metric must be defined. This is basically the fields of a pmDesc data structure as defined in pmLookupDesc (3). The following table describes the information required, some of the options and the values chosen for mover.nfile . The resultant archive contains one metric. 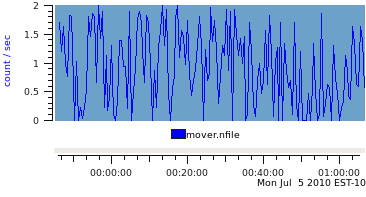 The number of files migrated in this example could be exported as either the instantaneous value over the previous sample interval, or accumulated as a running total. 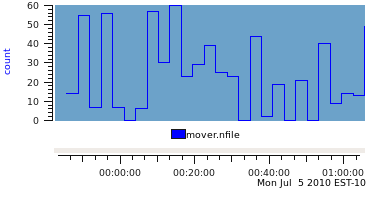 If the running total is used and the semantics of the mover.nfile metric remains PM_SEM_INSTANT the resultant archive produces a graph like this ... which is not generally useful for analysis! So we change the data semantics to be PM_SEM_COUNTER and rely on the fact that most PCP monitoring tools will automatically rate convert counters before displaying them. This produces a very similar graph to the first one (the plot style is the only difference) when the output archive is replayed with the same sample interval as found in the input log file (30 seconds). The real difference in the choice of data semantics can seen when the sample interval for replay is longer than the sample interval in the PCP archive. 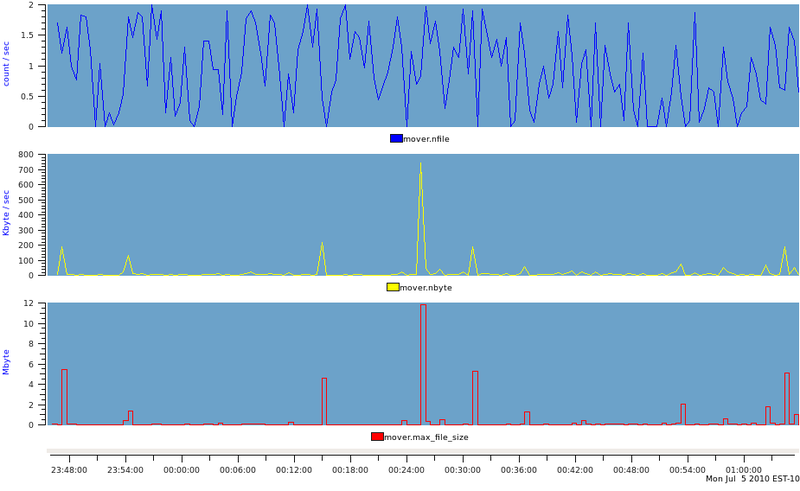 Using a replay interval of 180 seconds (6 times the sample interval in the archive), produces the following graph for the PM_SEM_INSTANT data. And the PM_SEM_COUNTER data is displayed like this. For the PM_SEM_INSTANT metric, the only choice available to pmchart (and indeed any PCP reporting tool) is to use the most recent observed value at each reporting interval. In the example above, this means 5 data values from the archive are skipped and the 6th value is used for each reporting interval. By comparison, for a PM_SEM_COUNTER metric, all the reporting tools sample the metric at the start of the interval and at the end of the interval and then report the linearly interpolated rate over the interval, which includes the "history" of what was observed in each of the 6 archive intervals for each reporting interval. This can be seen more clearly when the data is tabulated rather than plotted. Where the semantics of the data matches that of a free-running counter and where the total can easily be extracted from the input data source, it is always better to export PCP metrics with the semantics of PM_SEM_COUNTER . Note that the base value for a counter is arbitrary and zero works just fine. This produces a PCP archive that can be plotted with pmchart to produce the following graph. Metrics that have more than one value are supported in PCP through the concept of an Instance Domain (or indom ) which is a set with an internal unique identifier (an integer) and a unique external name (a string) for each instance that may have an associated values. There can be many Instance Domains. And many metrics can be associated with the same Instance Domain. This produces our final PCP archive that can be plotted with pmchart to produce the following graph. If there is a lot of data and/or a lot of PCP metrics, the calls to pmiPutValue (3) in the inner loop of the import application may become expensive as a consequence of the repeated text-based lookup for a metric name and an instance name. The LOGIMPORT (3) infrastructure provides a "handles" mechanism that may be used to improve efficiency. pmiGetHandle (3) may be used to obtain a "handle" for a metric-instance pair (once the metric and instance have been defined), then pmiPutValueHandle (3) may be used instead of pmiPutValue (3). The interpretation of the timestamps in the output PCP archive is dependent on the timezone in which PCP believes the archive was created. Since many import log files do not report the timezone, the LOGIMPORT (3) services assume a default timezone of UTC . An alternative timezone may be specified using pmiSetTimezone (3), but a corresponding adjustment needs to be made to the date and time conversions when arriving at the timestamp for each sample, e.g. using str2time () and/or ctime (). Unfortunately the format for the timezone offset is not handled the same in all places – for the ugly details, refer to the –Z command line processing and the do_label () procedure in the complete mover2pcp example code. For singular metrics, wrap the pmiAddMetric (3) calls in error handling logic, handle the per-metric metadata variations and create the handle for later use, see the def_single () procedure. The def_multi () procedure performs a similar function for multi-valued metrics, except the handle creation is deferred until each instance is processed. For each metric-instance pair associated with a multi-valued metric, the def_metric_inst () procedure maintains a cache of indoms and instances for those indoms so that internal instance identifiers can be allocated automatically and pmiAddInstance (3) is only called the first time each unique instance is observed for each instance domain. Also there is error checking logic here and a new handle is allocated for each metric-instance pair. The put () procedure is a wrapper around pmiPutValueHandle (3) that includes some error handling and stepping through the array of handles created earlier. Timezone and archive label details are addressed in the do_label () procedure. Add error checking at the end of the loop after each value has been added to the next output record. The complete mover2pcp Perl script can be viewed here .